Suspect mold in your home? We perform mold testing! We use a number of sampling techniques to collect air, carpet, and wall samples for laboratory testing. 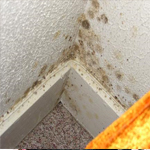 While mold is present virtually everywhere, some molds are more toxic than others. Some molds can cause adverse health effects such as respiratory problems, asthma, and allergic reactions. Understanding which type of mold has attacked your home allows us to counterattack it appropriately. It can also provide you with peace of mind knowing exactly what type of mold you are dealing with. Mold testing also helps us determine which areas of the property have high mold counts. Armed with this knowledge, we know where to focus our mold remediation efforts.